I’m a massive fan of Liz Earle products. Every beautifully packaged item I have tested has been a success. So when receiving a new item from Liz Earle, I do always worry it won’t live up to my expectations! With a sudden burst on heavy summer sunshine this week my skin went in to turmoil. I have always had combination skin which fluctuates alongside my hormones and the weather, so this burst of 28*C London sunshine was the perfect excuse to try two Liz Earle items I’ve had my eye on for a while. 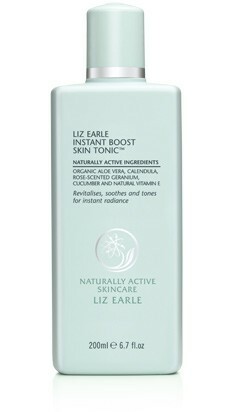 First on my list was the freshly scented Instant Boost Skin Tonic. This is packed with naturally active ingredients including a refreshing blend of essential oils, healing vitamin E and soothing organic aloe vera. This is a luscious cocktail of treats for the skin which will left my complexion thoroughly hydrated and revitalised whilst being naturally brightened. It’s exceptionally simple to use and with such a vibrant outcome it’s what I like to call a wonder product. It’s a definite must for any lady who cares about their skin. Second on my list was the Skin Repair Moisturiser. As I live in Live in London I am amongst pollution all day long, which is terrible for the skin. Liz Earle’s Skin Repair Moisturiser is rich in potent naturally active avocado and borage plant oils which work in harmony with your own skin’s natural oils, and natural vitamin E to help replace lost moister. This collaboration of vital ingredients gives your complexion just the right level of hydration and plants oils to leave it feeling clean and refreshed. After swapping my usual high-street bathroom brand for these two gems I actually felt like I had a facial. My skin felt extremely clean, radiant and non-greasy even after using the moisturiser. Liz Earle has once again triumphed and I will continue to spread the good word! Do I recommend them: 101%. Would I buy these items again: Yes. Paul Costelloe Pop Up Shop! After much acclaim following it’s debut last season, Paul Costelloe Man is once again offering the chance to own exclusive pieces from the Paul Costelloe Man AW11 catwalk collection in conjunction with John Lewis. Launched directly after Paul Costelloe’s opening show at London Fashion Week, a select collection of pieces from Paul Costelloe’s opening AW11 LFW show is available. The 35 piece collection comprises shirts, suits, jackets, coats and a selection of accessories, including scarves, handkerchiefs, ties and bow ties straight from the runaway. Only 7 of each piece will ever be made and each will be individually numbered 1 to 7, so every customer will know they own a unique item never to be reproduced. For the first time the product will also be launched on the John Lewis website and therefore available nationwide online too. The collection is available to buy until the end of this week. This is your chance to own a piece of fashion history! 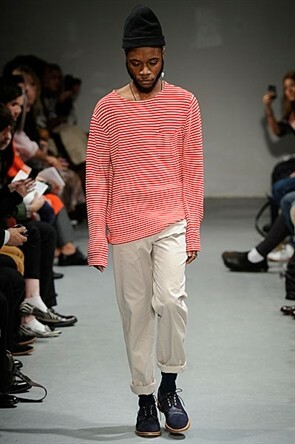 Oliver Spencer was my last London Fashion Week show. 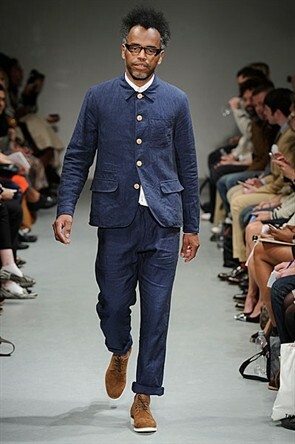 I’ve always adored Oliver Spencer for his speciality in British layering. 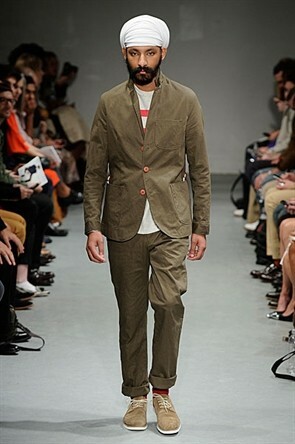 Another aspect of Oliver Spencer’s shows I love is his choice of male models. Unlike many other shows, sporting drab looking chaps in need of a good Sunday roast, Spencer chooses real men from all walks of life. Four of my favourite ensembles are as follows. The Paul Costelloe show was my first event at London Fashion Week 2012. The tent was overly full like fashionista sardines in a tin, each one of them furiously tweeting away with the exception of myself. The reason being the clothes were too beautiful to stop watching. Afraid I would miss any details of the gorgeous sixties-esque shift dresses, I sat with my eyes peeled. Costelloe’s collection saw British tailoring, and modern textiles mixed with an adventurous example of the 1962 Hollywood classic What Ever Happened to Baby Jane? This exceptionally wearable collection saw an eclectic gathering of sweetie pinks, golds and greens held up against warm shades of mauves and silver blues. 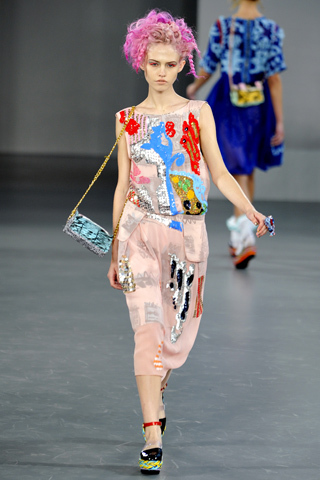 The colour palette complemented the separation between the tailoring and the flirtatious babydoll dresses. 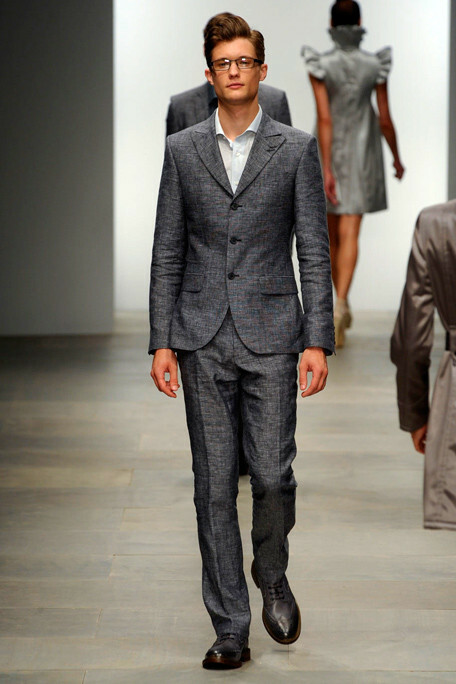 My favourite ensemble was the first men’s suit to strut itself down the catwalk. Such a handsome three button suit, with a sharp ticket pocket sewn in. 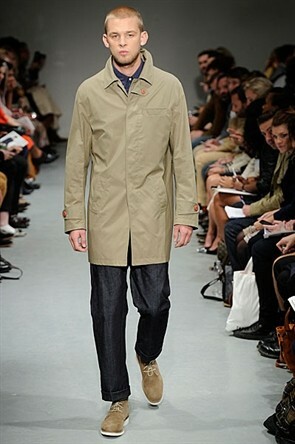 Frog mouth pockets on the sharply tailored trousers gave a nod back to the relevant 1960’s inspiration. On reflection I recall enjoying this show the most over fashion week. I cannot wait for next season. The queen of colour within contemporary fashion, Louise Gray, really did get my fashion juices flowing at London Fashion Week. Gray’s talent for quirky meets cool was on show as the most dynamic show of the whole week flew in to full swing. 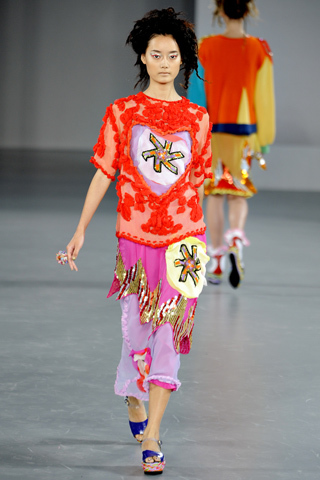 There are many designers who seem to have forgotten that within fashion, respect must be earned…all eyes on Meadham Kirchhoff….one massive fashion faux-pas! Just laughable ensembles that separated the try hards from the fashionistas at London Fashion Week. Louise Gray offered slabs of colour complemented with stylish drapery and fine tailoring. Accessories at the ready, the models were styled to the max. Colour and a celestial celebration of style was covering the catwalk. I cannot wait for next season. J’adore Louise Gray! 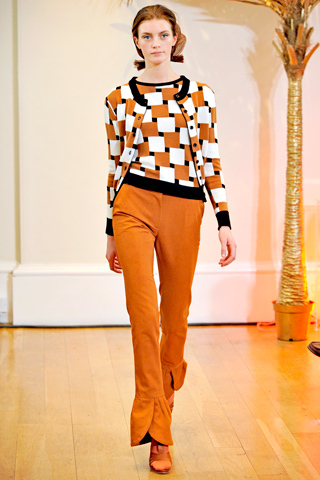 Peter Jensen’s Spring 2012 Ready To Wear collection brought a pick ‘n mix of prints and styles to London Fashion Week. What was on offer was a varied range of textiles, layering and a playful colour palette which subtly brought everything together. The collection’s design inspiration was entirely drawn from style legend Nina Simone. Jensen created the church-white inspired outfits of her youth in North Carolina, as well as the brightly colourful satin ensembles inspired by what Simone wore to attend jazz clubs around the world. The models were by far the best styled of LFW so far. My four chosen ensembles are as follows. Three highlights/delights from Paul Costelloe’s Autumn/ Winter 2011 collection. This season I find myself hugely inspired by this rich tapestry of warm colours and textures. Excited by this right-on-time skirt suit rejuvenation, I’ve stocked up on mulberry shaded tights and funnel neck pullovers. It’s the Mod re-revival…but this time with a bit of class. I am a huge fan of festivals. Everything about them I adore, apart from my over keen beauty bag that always seems to take up most of the space in my rucksack! This year I decided to be ultra organised and only bring good quality, miracle working products! These products have all been tried and tested and I can guarantee 10/10 for quality and confidence assurance! This is an essential as it cares for your lashes as well as plumping them to look like falsies. Only one coat of this is needed to achieve beautifully glamorous lashes girls! 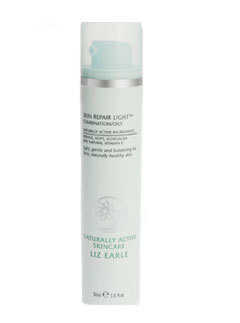 2.Liz Earle Eyebright Cleansing Lotion. Bonfires, glitter and cigarette smoke are all aspects of a festival that can leave your eyes feeling dry, itchy and tired. This is a lovely product because it really does revitalise your eyes! One downside to festivals is the lack of showers! When you eventually find one you’re either told there is a two hour queue or that you’ll probably come out dirtier than you went in! Batiste’s mini dry shampoos are perfect for any festival. They are compact, feather-light and the dry shampoo itself allows your hair to feel fresh and leaves it smelling great! Reflects Antique Gold is a fabulous product for festivals as you can use it anywhere on your body. I like to smudge a fingertip full on the top of my cheek bones and a smudge on my lips for a rock chick look. Havaianas sent me these wellies so I thought this would be the perfect time to welcome them in to the world! They are very smart and comfortable. I really look forward to jumping in the mud wearing these. Lipbalm is something I am slightly obsessed with. I chose Carmex for Bestival because I find it really lasts. It also contains SPF15 which is great for looking after your lips. This is a brand of facial wipes that I truly trust as they remove all make up, as well as cleansing and moisturising my skin whilst feeding it vitamins. I can’t think of a reason not to choose these! 8.M.A.C Nail Lacquer in Shirelle. Chipped nails are a common occurrence at festivals. This line of varnishes is filled with strengthener and is the most hard-wearing varnish I have ever come across. I adore this classic red, it will match my Topshop raincoat perfectly! 9.Topshop Shiny Plastic Rain Mac. Retro style meets comfort and utility. What more do you want from your festival coat?! STYLEBOP launches online fashion magazine. STYLEBOP announces the expansion of its editorial content with the launch of its first online fashion magazine to be launched on September 8th. The publication will feature a dynamic mix of fashion, style and culture. Coverage will include designer interviews, new label spotlights, street style, social events, behind the scene access, as well as the hottest news fresh off the catwalks. 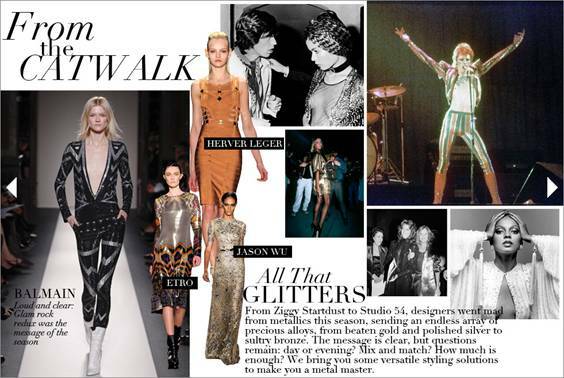 It will offer an exciting and compelling look at the world of style, filtering through the best in fashion news. In addition to fashion editorials, the publication will continue STYLEBOP.com’s commitment to bringing high style from the catwalks to the sidewalk.